A new speculative rendering image of a new Suzuki bike has been surfaced, and it looks like it will be a 250cc entry level sports bike from Suzuki Motors. Going by the looks, it seems like this will be a two cylinder motorcycle, which has been crafted magnificently by the Japanese Manufactures. Though, we can only see the side profile of the bike in the image, there are few things that we certain. 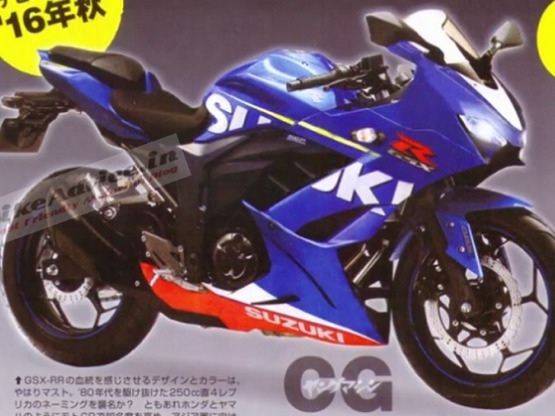 Firstly, the bike’s design has been borrowed from Suzuki’s Gixxer platform. The fuel tank, split seats and shield shaped headlamps makes it a sharp, edgy and a good looking sports bike. The image also contains some Japanese texts that are extraterrestrial to us. But going by trends of 250cc and 300cc engine, which two wheeler manufactures are following these days, we speculative it to have the same engine displacement. Two exhaust pipes also hint it to be a two cylinder motor. Also it looks like the bike will be launched or at least unveiled in 2016. As of now, there is no official confirmation or any details available from Suzuki about this upcoming 250cc. But as per reports, just like its Japanese rivals, Suzuki is also working on a 250cc bike which can only mean that this rendered Gixxer 250 may or may not be the final product, but if it is even close to what we can see in the image, the battle between Yamaha R3 and Kawasaki Ninja 300 will become war with Suzuki.